U.S., China Unveil Plan To Curb Greenhouse Gases : The Two-Way The proposal includes a nationwide cap-and-trade system beginning in 2017. China and the United States are the No. 1 and No. 2 emitters of heat-trapping carbon pollution. 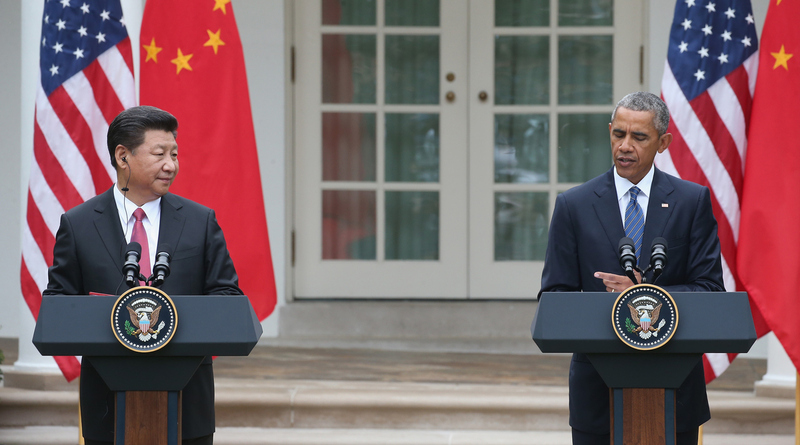 President Obama and Chinese President Xi Jinping hold a joint press conference in the Rose Garden at the White House on Friday. The United States and China unveiled an ambitious plan to curb greenhouse gases today, including a nationwide cap-and-trade system beginning in 2017. The announcement came after a White House summit meeting between Chinese President Xi Jinping and President Obama, as the two leaders begin to fill in the details of the far-reaching climate goals they agreed to last November. China and the United States are the No. 1 and No. 2 emitters of heat-trapping carbon pollution. Obama and Xi hope their commitment will prompt other countries to make similarly strong pledges to combat climate change in advance of an international climate summit in Paris later this year. Climate activists in the U.S. tried and failed to push a cap-and-trade bill through Congress during Obama's first years in office. As a result, the administration has relied on executive actions to control greenhouse gases, including new limits on power plants — the country's leading source of carbon pollution. The climate accord is a rare point of agreement in what was expected to be a tense meeting between Obama and Xi. During a joint press conference at the White House, President Obama said the United States and China had "reached an understanding" regarding the cybertheft of business secrets. Obama said he and Chinese President Xi Jinping had agreed that neither country would engage or support the cybertheft of business secrets. "This is progress," Obama said.